Here is what leaders should do today to grow leaders for tomorrow. A person who transforms metal into gold. Prakash Iyer, Author and Leadership Coach, Former MD, Kimberly Clark Lever shares that “Just like an Alchemist who turns metal into gold, the job of today’s leaders is to nurture their employees into leaders for tomorrow. Leaders today are confronted with ongoing economic uncertainty and geopolitical instability. At the same time, they are also required to navigate through an increasingly complex global marketplace with a growing millennial workforce. It is a brave new world for today's leaders, which is why there is no time to waste developing tomorrow's leaders. But how does an organization find these golds in the rough? How do we find the best people and nurture them into great leaders? • How can I get passion unleashed in this organization? • How can I get people to be passionate about what they do? Passion is that magic ingredient that can allow leaders to bloom. Peter Drucker once said ‘Culture eats strategy for breakfast,’ which means a powerful and empowering culture was a sure route to organizational success. However, Iyer feels that in the process of building leadership, we tend to skip the breakfast and leave strategy alone. If you want to create a culture, unleash passion among employees across the organization. Instilling passion among employees brings them closer to their work and organization culture, values and purpose. Find a way to know your people. Test for leadership and test for mettle. All that glitters is not necessarily gold, and hence, one shouldn’t have a pre-conceived notion about an individual who can become or not become a leader. Leadership doesn’t need to be judged by a person’s look, title or level, but by an individual’s mettle. Office hierarchy will be history! Leadership is not about how much success you achieved but it about how other people succeeded under your leadership. Before you are caught up with the various leadership traits, look for someone who is a team player, look out for people who helped other people achieve their goals. Leadership is often overrated. It is teamwork that matters. It is team players we should go after. Converting gold from metal is a lengthy and challenging process. It is subjected to high-pressure processes, hammering, chemical techniques, etc. Similarly, nurturing an individual into a leader is not a one-day process and hence, should be started as early as possible. But how do you start training them? Or which is the best school to impart leadership training? Iyer believes leadership training starts from the shop floor. It is learned at the company’s stores, with customers. Do not protect your young leaders. Let them step out from their comfort zone and let them learn from themselves. According to a survey conducted by Champions League Europe, it was found that two-footed football players, on an average earn 27 percent more than a single-footed player. Being ambidextrous, increases flexibility improves the ability to score goals, and one can play on either side. Businesses need to take a lesson from this instance. We all need leaders who are two-footed. Too often, we have leaders who are great in one area and hence their way of approaching various situations are limited. Thus, look out for leaders who are good at one skill or one function. The most valuable resource any leader has is the human talent, passion, and ingenuity working within it. Empowering each one of them and turning them into a may be the greatest challenge for today’s leaders, but it is also the most rewarding. 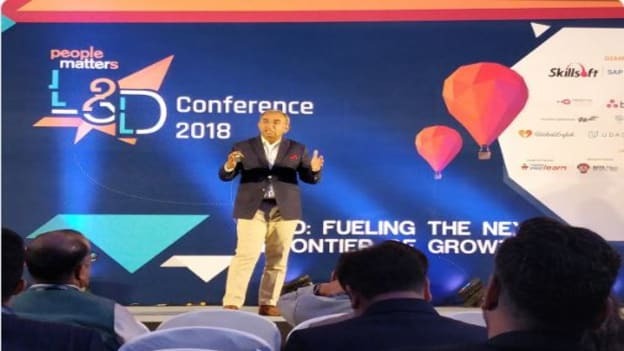 Note: This session is curated from the session hosted by Prakash Iyer, Author and Leadership Coach, at People Matters L&D Conference 2018 in Mumbai.